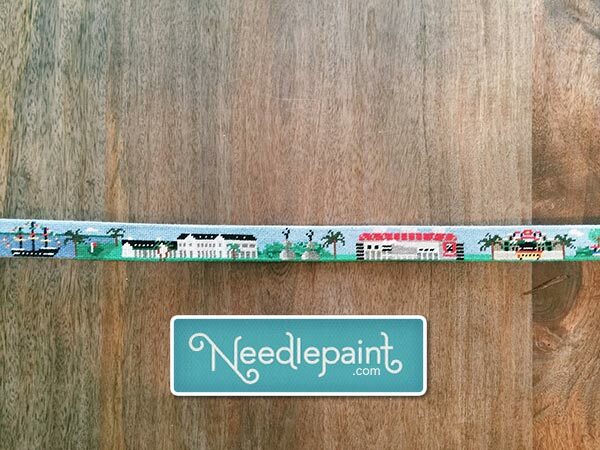 NeedlePaint Turns Your Favorite Games Into Your New Favorite Needlepoint Accessories! Here at NeedlePaint, we’ve been inspired by our favorite games, and have created some new needlepoint accessories you’ll love stitching, as well as using after they are finished. We’ve also discovered that both needlepointing and playing games, share some amazing benefits. Playing a fun game provides for a break from the routine of day to day life. Games let you reconnect with family and friends, and enable you to enjoy the social aspects of spending time with those, whose company you love. Playing games are also a great way to get everyone involved, young and old, in one single activity. Rack ’em up! Our new Billiards needlepoint wallet canvas, is fun for both the novice and competitive player. A game of great skill, accuracy, calculated moves, and precision study. It certainly doesn’t hurt to have paid attention in geometry class, as knowledge of angles can really boost your game. Just look out for that eight ball . . . it will always cause you trouble. This wallet will definitely add some color to your back pocket. Did you know that needlepointing has some of the same benefits as playing billiards? Both improve analytical thinking, require planning, decision making, and are great for your eye-hand coordination. There’s no spell check in this game! Our Custom Classic Word Game needlepoint belt canvas, lets you create a custom phrase, spell out a quick message, list your kids names, or use our shown phrase “May the force be with you”. A fun belt to stitch and later to wear on family game night. Obi Wan Kenobi would love wearing this belt! Needlepointing and word games are well known for keeping your mind sharp, as well as providing exercise for the brain, helping to maintaining memory function. Both require a certain level of singular focus, and concentration. No multi-tasking, necessary. Ante Up! With our Poker needlepoint wallet canvas you will be the envy of all of your poker buddies. This is a game of chance, and it never hurts to have a fair amount of skill. Knowing when to bet and when to fold are crucial to your success of this game. You’ll enjoy opening this wallet and tossing a five spot onto the kitty. Needlepointing and the game of poker develop logical thinking and develop concentration to help expand your long term ability to focus. Check Mate! Stitch our Chess Needlepoint belt canvas for the novice or a competition player of the game of chess. We have designed this belt with that familiar game board and all of its pieces: pawns, rooks, knights, bishop, king and the queen. We guarantee stitching this needlepoint belt canvas will be easier than playing the game of chess. Needlepointing and the game of chess, increase your creativity, exercise both sides of your brain, along with lowering your stress levels and blood pressure. It’s time to enjoy a little down time, relax, reconnect with family and friends while playing a game; or do a little needlepointing . . . especially if you’ve had too much family togetherness. Calculate your next move and enjoy stitching your new NeedlePaint projects! Did you miss the November 1st Christmas deadline for ordering your custom needlepoint belt? We’ve found over the years that most people do not plan their Christmas gifts 2-3 months in advance. When they finally do decide that a custom needlepoint product would be a perfect gift, (which they really are), they come asking to see if there is any way we can help. Below is an example of what our gift cards look like. We will put your design into the gift card once it has been approved and email it to you (we can print and mail it, too, on request). We’re fast with our custom designs, it takes us 3-5 business days to create your preview once your order has been placed, which we email to you for your approval. We allow unlimited revisions, as we want you to love your design and shop with us again in the future. We also offer a returning customer discount! We will be taking Gift Card orders until Dec. 19th. 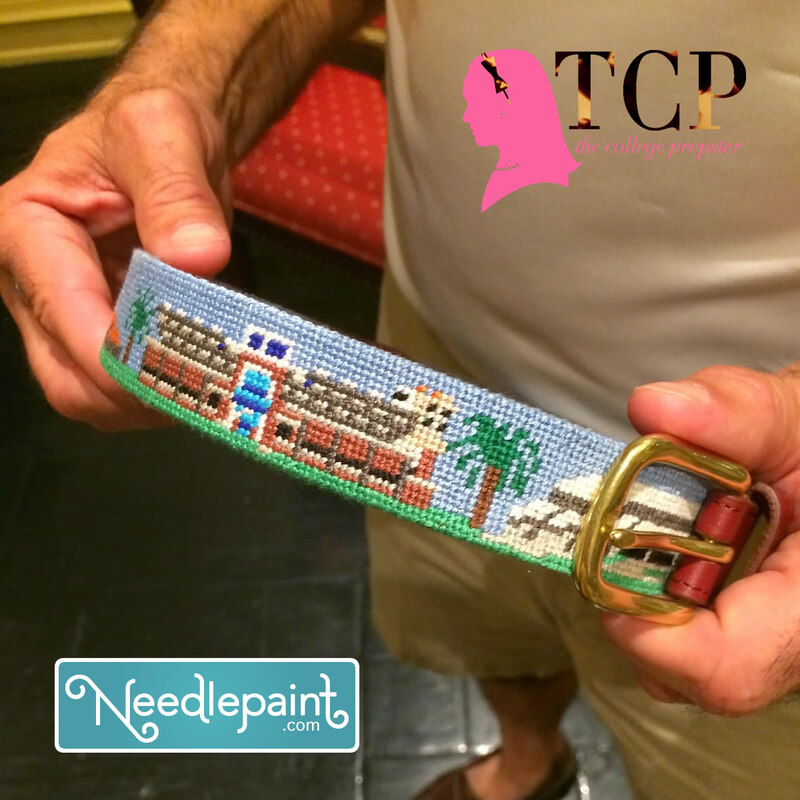 If you haven’t already heard, we’re hosting a custom needlepoint belt giveaway with our long-time friend Carly of “The College Prepster” blog! Carly Heitlinger is a preppy blogger who grew up in Florida, began blogging while studying at Georgetown, and now lives in New York City where she continues to find inspiration for her style. Her blog is full of great tips on what to wear, what to see, and what to do! 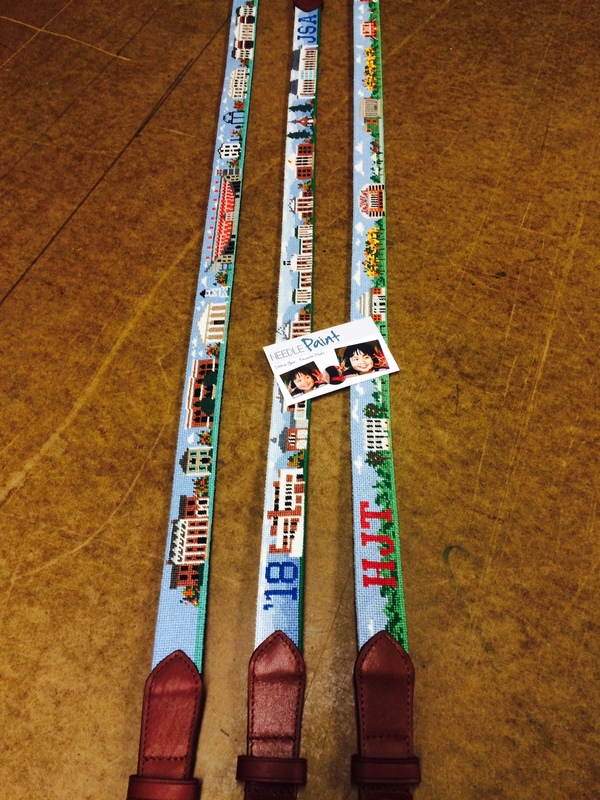 We recently collaborated with Carly on a custom belt showcasing the landmark sights of South Tampa for her father. 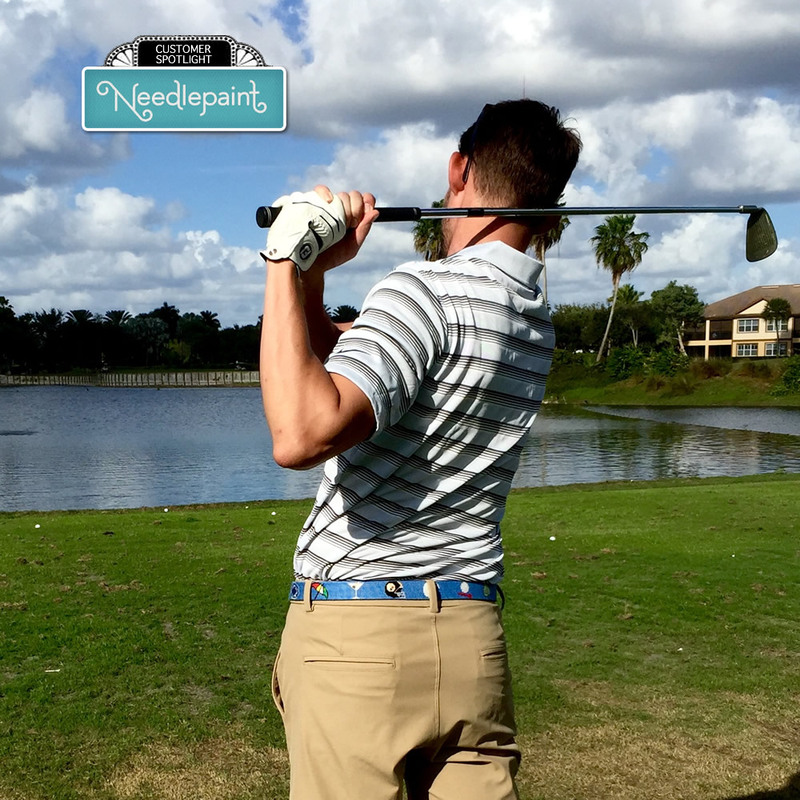 Together with Carly, we brought her father’s favorite places to life: from the country club where he golfs, to the University of Tampa, to the high school campus that he and Carly both attended, the essence of each building is captured on the belt. 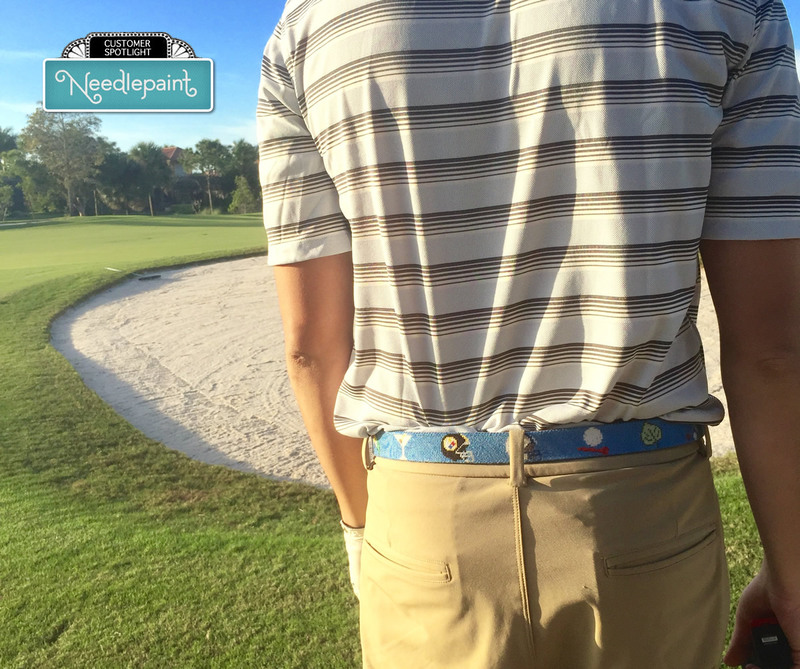 Carly says she is “obsessed” with the way that the belt came out and said that her “dad’s been wearing it a lot, and all his golf buddies are jealous.” We’re excited to hear that they both are enjoying it as much as we enjoyed making it! 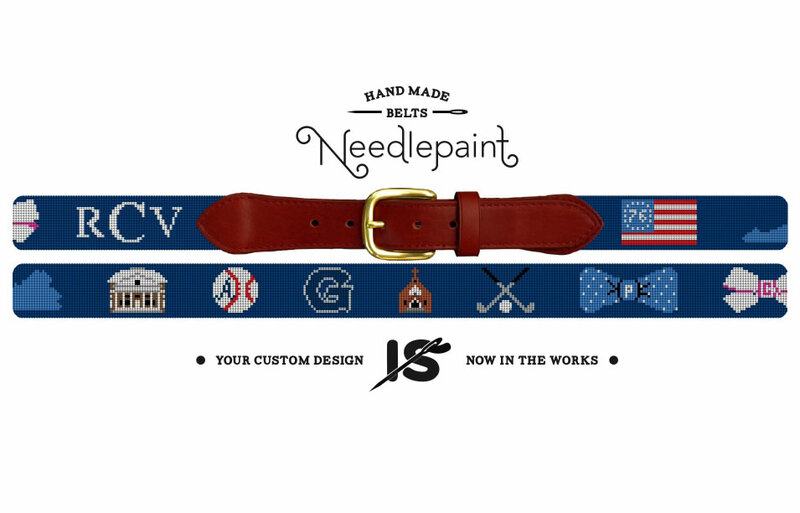 Together with The College Prepster, we’re giving you the opportunity to win your very own custom Needlepaint belt. Simply visit Carly’s website here and enter the giveaway for your chance to win your very own custom belt. 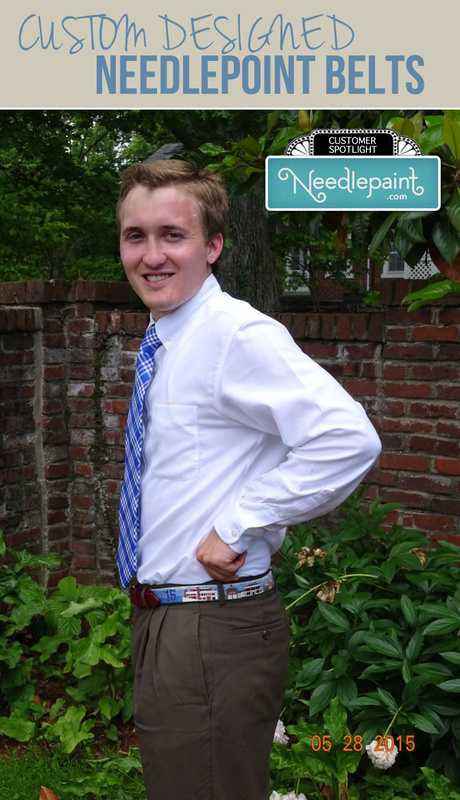 We love getting photographs back from our customers with them wearing our needlepoint belts! The first two photos were taken by Carly’s (AKA the College Prepster) family. We’ve worked on a few projects with her, and will hopefully have more in the future. 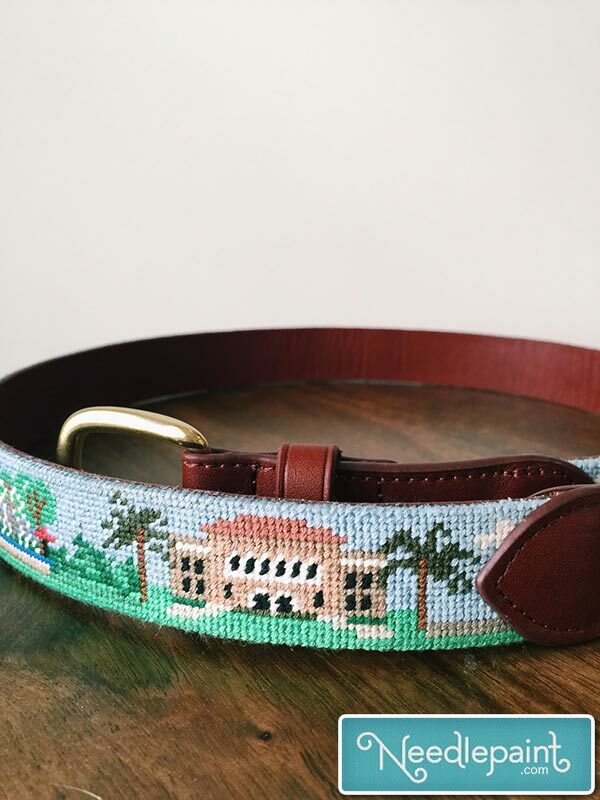 This design features the University of Florida Campus Needlepoint Belt in Gainsville, FL. The details and buidling names can be seen on our website, just follow the link above. Next we have a Washington and Lee Campus Needlepoint Belt. This features the blue ridge mountains as a backdrop and many campus highlights. And to answer his mother’s question “Do you think he was proud?” I think so! Congraudations Yates! Last is a series of photos from Amber, who had a lot of great input in this amazing gift. The perfect accessory for summer! To read some more testemnial reviews from some of our customers, see below or click here. Click the following link to learn more about desiging your own custom needlepoint belt or DIY needlepoint canvas. 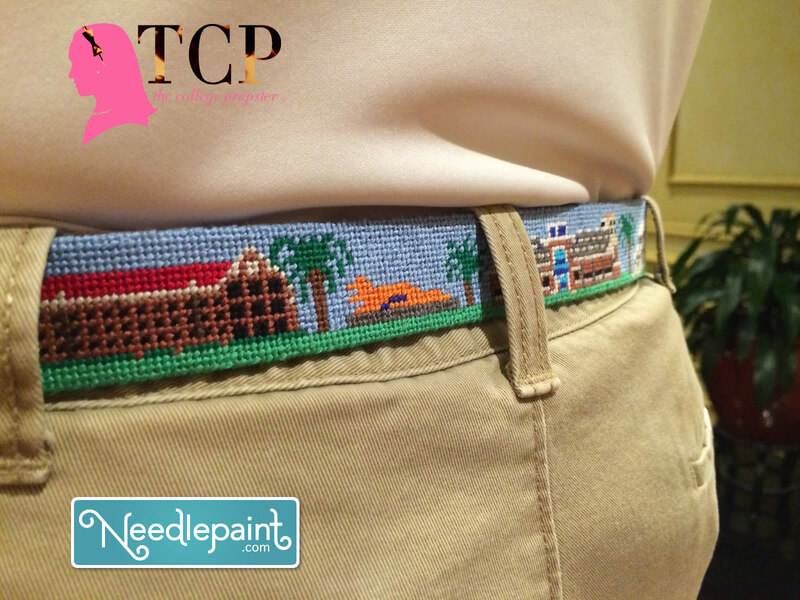 We continue to suprise and delight every time we design a new college campus needlepoint belt. This blog post features the University of Missouri Campus Needlepoint Belt. The Mizzou columns take a prominent place in our Mizzou campus needlpoint belt along with, Memorial Stadium, Student Center, Tiger Plaza, Jesse Hall w/ statue to left, Mizzou Columns, Memorial Union, Mizzou Arena and one of Columbia’s favorites, Shakespears’s. 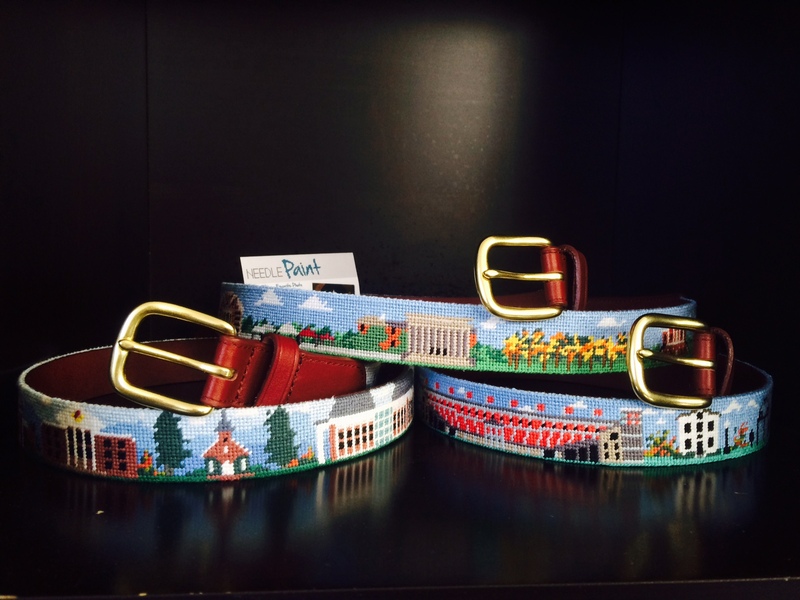 Check out our other college campus needlepoint belt designs. And if you don’t see the school that you are looking for, click the link at the top of the post to comission a custom college campus design! All of our belt designs are available as fully stitched needlepoint belts, or as DIY needlepoint kits. It is nice to get away, and come back to see freshly stitched projects that turned out wonderfully! 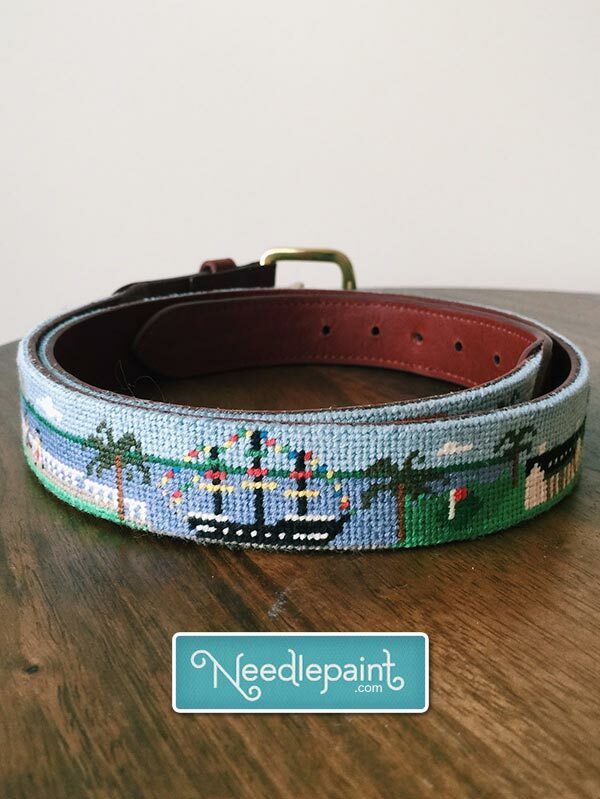 If you have an idea for a custom needlepoint belt, let us know we’d love to help make it look amazing! Ali in Massachusetts has emailed us pictures of her most recent project, nice stitching Ali! 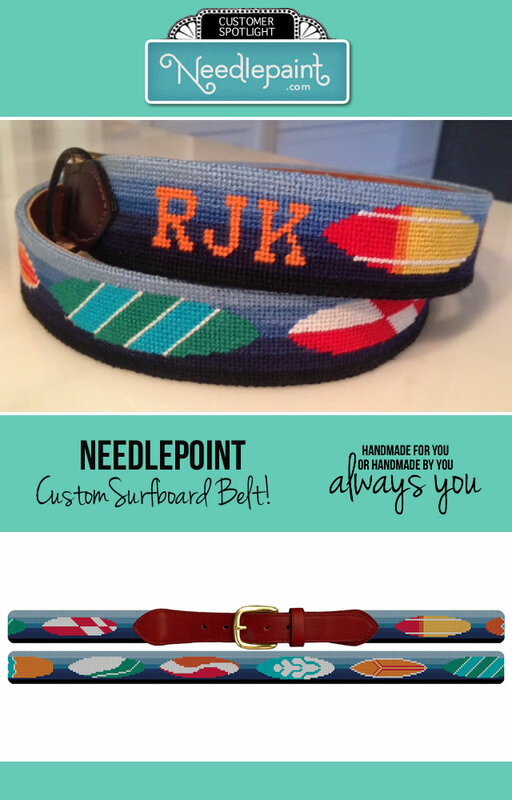 The surfboard needlepoint belt features colorful surfboards, both short and long. If you are thinking of getting a belt or canvas for your favorite surfer, we will be happy to change one of the boards to incude their own surfboard on the belt. Please share or comment if you like Ali’s work! Our college and universtiy campus needlepoint belts have gotten a lot of great reviews and even been featured in popular blogs. Here are three campuses we recently stitched! University of Georgia, Washington and Lee, and the University of Alabama. Below the pictures are some recent reviews from our customers. Here is some feedback that feels as good as the bright Colorado sunshine!